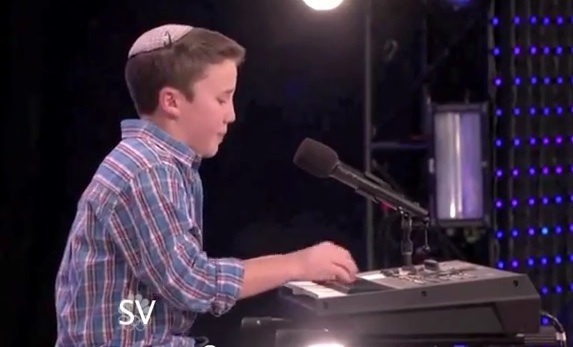 Watching Edon Pinchot on "America's Got Talent" tonight I found myself praying. Not praying that the adorable 14-year-old Jewish boy wearing a kippah would win. I was praying that Howie Mandel and Howard Stern wouldn't make any stupid jokes. Kudos to Howard Stern for holding back and focusing on young Edon's singing ability rather than his obvious religion and religious garb. I guess the other Jewish judge named Howard couldn't resist. Howie Mandel praised Edon and then asked him if he got a standing ovation at his bar mitzvah too. Not a horrible remark. But then Howie Mandel went the silly pun route and actually said to the young boy, "I said it before and I'll say it again: From one to another, Jew are terrific!" Howard Stern came off looking much better by first suggesting he doesn't use a fog machine and then explaining how impressed he was with Edon's performance. After an earlier performance Howard Stern criticized Edon for having a whiny voice, but this time around he said the young boy is humble and nice and that "America's going to fall in love with you." Wonderful voice and talent but could not understand a word of the song, What was he singing? Mandels jokes weren't funny at all. I'm a huge Stern fan, and I love when Stern talks about his Jewish heritage. I thought Mandel's jokes were offensive and rude. I'm all about free speech, but thats just a place you do not go to. This kid is VERY talented. Glad Stern and Osborne could acknowledge that much. Edon has an awesome voice!! Love seeing him wearing his kippah & being proud of being Jewish!! What's wrong with Howie being funny "from one Jew to another"? Can Jewish folks not have a sense of humor? I know lots of Jewish folks & they have a hilarious sense of humor!! If you're Jewish & you are insulted if someone makes a remark that calls attention to your "Jewishness"....well, you need to get over yourself & ask yourself why you resented Howie's "funny connection" & how he expressed it. GOD BLESS THE JEWISH PEOPLE!! Loosen up & be proud. Hey man, I'm not even Jewish, but Mandel's comments were offensive. Why not leave a person's race or ethnicity out of it? Mandel's ignorance made it seem he had the kid's back because he was Jewish. Pathetic. Personally I think the kid is ok, but anyone can sing with the music that loud and drowning him out. Mandel feels threatened by Stern because he is much funnier. Sad. I also didn't think it was cool for nick cannon to reference puberty. This kid is on a talent show to be judged by his singing performance. He's a jew and he's 14 so puberty is a fact of life but what 14 year old wants that pointed out on national tv?